An engaging and funny booklet containing six pictorial maps of the 1939 New York World's Fair. The New York 1939 Official World's Fair Pictorial Map. This is a complete 1939 Tony Sarg New York World's Fair pictorial map booklet. 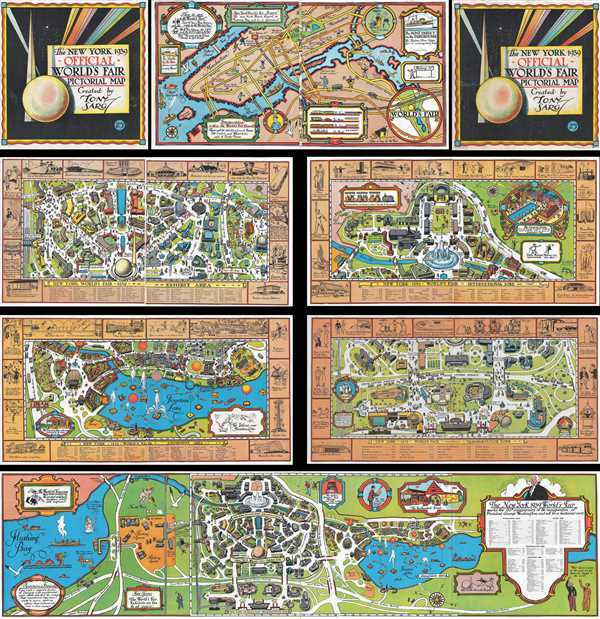 Six different maps are included in the booklet: one depicts the entire grounds of the World's Fair and measures forty-four and one-half inches long, another features the New York City Boroughs of Manhattan and Queens and illustrates the many different ways in which visitors could make their way to the fair, and the other four depict the Exhibit Area, International Zone, Amusement Area, and Transportation Zone of the World's Fair in detail. Brightly colored and engaging, the four principal forms of transportation to the World's Fair, train, 'motor' (car or bus), subway, and boat, are depicted here. Each of these different forms of transit are illustrated using different colors and/or symbols, such as railroad tracks for the train, yellow 'roads' for cars, and orange lines for subway routes. Various sites around Manhattan are labeled, such as Washington Square, Union Square, and Central Park, along with seventeen different Loew's theaters located throughout the borough. Vignettes are used to inform viewers that boats provide direct transportation to the fairgrounds, along with the fact that parking costs fifty cents and that there will be 100 greyhound buses, 538 electric and wheelchairs, and fifteen tractor trains available for use within the fairgrounds. Illustrating the fairgrounds from Flushing Bay to the Fountain Lake, where there was a nightly fireworks display, a fantastic overview of the entire fairgrounds is provided. An index, divided into the four main zones and areas, includes the names of all of the major attractions at the fair and their corresponding grid location on the map. Employing a jocular tone throughout the booklet, King Neptune is depicted in Flushing Bay, joking that 'Grover Whalen (the Fair's organizer) has cramped my style with all those fountains' and the 'North Wind' is a cherub blowing air out of a bellows. A vignette of The Enchanted Forest is included along the top border. Each of the other four maps illustrate one of the four zones of the fair: the Exhibit Area, the International Zone, the Amusement Area, and the Transportation Zone. An index is situated along the bottom border of each, listing the attractions within that particular area or zone, and giving the corresponding grid location so that tourists could easily locate the attractions they wished to visit. With such a wide array of choices, and entertainment for all ages (including a Macy's Toy World for the kids), everyone attending the fair was bound to find something that drew their interest. There were shows, exhibits, restaurants serving food from all over the world, and even a small zoo, within the fairgrounds. Each of these maps is framed on all sides by a series of vignettes, illustrating either the buildings within the area or zone in profile, or with tourists stating their desire to visit a certain exhibition or wanting to buy a Coca-Cola or an ice cream. This booklet containing six different maps of the 1939 World Fair was drawn by Tony Sarg and published by the New York World's Fair. The booklet measures 11 x 11 inches square when fully folded up, the five smaller maps measure 11 high x 22 inches wide when unfolded, and the large panorama map measures 11 high x 44.25 inches wide when fully unfolded. Anthony Frederick Sarg (April 21, 1880 – February 17, 1942), known professionally as Tony Sarg, was a German American puppeteer and illustrator. Sarg was born in Cobán, Guatemala, to Francis Charles Sarg and his wife, Mary Elizabeth Parker. The elder Sarg was a consul representing Germany; Parker was English. The family returned to the German Empire in 1887. Sarg enrolled at a military academy at 14 and received a commission as lieutenant at 17. In 1905 Sarg resigned his commission and relocated to the United Kingdom, where he pursued a relationship with Bertha Eleanor McGowan, an American he met in Germany. They were married in her hometown of Cincinnati, Ohio, January 20, 1909, and returned to England where their daughter Mary was born two years later. In 1914, with the start of World War I, he sent Bertha and the children to Cincinnati, followed them soon after, and settled the family in New York City in 1915. He became a naturalized U.S. Citizen in 1920. Sarg's grandmother collected puppets and passed the passion on to Sarg, who began to work as a hobbyist puppeteer. He produced his first animated film, The First Cricus. Later he designed several enormous helium balloons in the form of animals for Macy's department store, giving rise to the tradition that is still favorite of children at the annual Macy's Thanksgiving Day Parade. He also worked on the puppets in Macy's famous Christmas window displays. The pinnacle of Sarg's career his presentation at the 1933 Chicago World's Fair, where his work reached a cumulative audience was 3 million. After this event his economic fortunes declines and he was forced into bankruptcy by 1939. In mid-February 1942, Sarg had surgery for a ruptured appendix, and died three weeks later of complications. He interred at Spring Grove Cemetery in Cincinnati, Ohio. Very good. Booklet. Light wear along original centerfold. Large folding map of the New York World's Fair separated from booklet. Centerfold of large folding map reinforced on verso. Rumsey 8890.001, 8890.002, 8890.003, 8890.004, 8890.005, 8890.006, 8890.007.